Working out during the pregnancy has been shown to have a very positive effect on not only the pregnancy but also labor and recovery from pregnancy. Your body changes dramatically during and after the pregnancy and it’s important to customize your training to your body’s changes. The training is safe, in a comfortable environment and adjusted to your ability. Coach Tilda has extensive training in pre/post natal fitness and prenatal massage therapy. Fitness training and massage therapy packages are available upon request. Check out Coach Tilda’s app for moms-to-be and new moms! Exercising during the pregnancy has been shown to be good for both the mom and the baby. 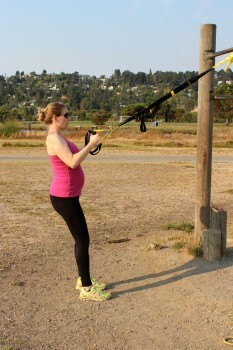 The training is very specific to your level and also to your week of pregnancy. The focus is on maintaining muscle mass, core stabilization, postural alignment and cardio. The training could help prevent injuries and other body discomfort during the pregnancy and help you through labor. There are many physical changes that happen to the body after being pregnant and going through labor so the training is customized to you and your body. It could take up to a year to fully recover and get back to your “body before pregnancy”. The focus is on reactivating the core muscles and building up strength and cardio slowly. Postural retraining and potential weight loss could also be a part of the program. Sometimes the body doesn’t cooperate and problems like Diastasis Recti, Symphysis Pubis Dysfunction (SPD) and pelvic pain occur during and after pregnancy. Specific training and rehabilitation is then necessary and Coach Tilda has knowledge and experience in those areas.